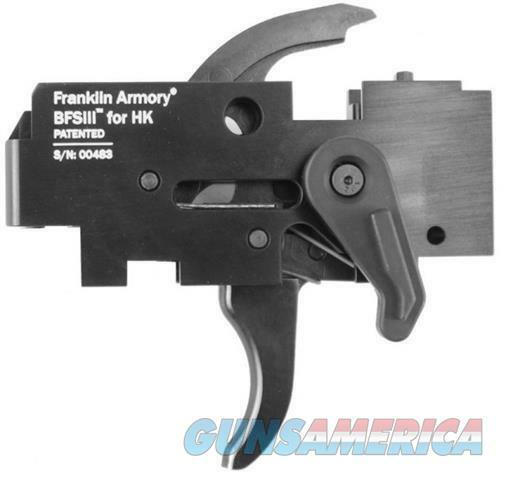 Description: LISTING IS FOR A NEW IN THE SEALED FACTORY BOX FRANKLIN ARMORY BFS III HK-C1 CURVED TRIGGER FOR HECKLER & KOCH MP5 SP5K VARIANT FIREARMS. CHECK MY FEEDBACK FOR REASSURANCE & REALIABILITY. The BFSIII™ for HK is a 3-Position Trigger. In position 3 it will fire 1 round on Pull and 1 round on Release. This makes it the fastest semi-automatic trigger on the market. The BFSIII™ is ideal for Tactical and Competition use. The BFSIII™ provides greatly reduced split times between rounds and the ability to place two separate shots into a tighter group. * A trigger pull around 4.5 pounds. * Safety Selector will fit in most two and three position trigger housings. * Works in SP5K housings. * Trigger housing, ejector, ejector pin and ejector spring are not included. Phone # fax# OPEN 10-5 for internet sales and 8-6 for store front sales both 7days a week. I am a FFL dealer. Add 3% for all credit card sales. Michigan sales must pay tax.